Wow! The new Adidas soccer ball, called Teamgeist, designed and developed especially for FIFA World Cup 2006 in Germany, looks really impressive. The new match ball is designed in white, black and gold, the colors of German national soccer team and the FIFA World Cup trophy. The name "Teamgeist" in German means: team spirit. 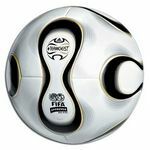 "The ball's name is a brilliant idea, especially for a World Cup tournament," said Brazil midfielder Kaka. "During the World Cup, players are together for 50-60 days and team spirit is very important. You cannot achieve anything on your own." 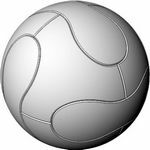 What make this soccer ball very unique is not just the pretty cool visual appearance, but very radical construction technology. The Teamgeist ball is manufactured from 14 thermal bonded panels. This had never happened before. Most of soccer balls are made of 32 or 26 panels. The question is, if reduced amount of panels would be in any benefit to players. According to Adidas "only balls with a perfectly round and smooth surface react reliably and consistently when kicked. Key to the unmatched performance of the new Match Ball is the revolutionary 14-panel ball construction. This innovative configuration brings down the number of three-panel touch points by 60% (from 60 to 24) and the total length of the panel lines is reduced by over 15% (from 400.5 cm to 339.3 cm). The Thermal Bonding technology, which Adidas successfully introduced in 2004, has been further refined to give the Teamgeist performance qualities found in no other ball." It basically means that this ball, supposedly, is perfectly round and balanced offering outstanding accuracy when kicked. some luck to score goals, make great passes or control the ball with ease. It's not just the ball. On the other hand, the great designed and manufactured soccer ball will not "bather" your game, like some "bad" balls. It can only help. Having said that, looks like the Teamgeist, is the ball that can only increase level of your game. It seems this ball is really comfortable to play. It is worth to notice that this ball's water absorption almost does not exist. It means the ball is virtually waterproof; therefore its performance characteristics in dry or wet conditions should be almost identical. The Adidas football laboratory in Scheinfeld, Germany, features a high-tech robotic leg, which is used for a variety of ball tests. The machine is able to repeat an identical kick in the exact same angle and with exactly the same speed and power, time and time again. Extensive tests conducted with the robotic leg show that the new Adidas Match Ball is 30% more accurate than top competitive balls tested. A high-speed camera is set up parallel to the impact to analyze the impact on the ball. The new 14-panel configuration, featuring fewer seams, makes the ball perform significantly more uniformly, no matter where the ball is hit. "Just using it in training, all the players at Real Madrid have been impressed. With the ball's movement, it doesn't go off everywhere, it goes where you want it to go and that's important. Your passing, controlling and shooting of the ball - it's in one direction and that's what you need." "You have the old-style colors which remind us a bit about football's history but also the modern technology, so you have a blend of the future and the past." "When you kick it, it goes in the right direction which sounds obvious but is really important." I would like to add one more interesting thing about the new Adidas Match Ball. It is the first ball ever to feature a complete under-glass print technology, providing the Teamgeist with the best and strongest surface material ever and guaranteeing the ball is more durable and will hold its unique look much longer.